America is linked to Israel, both physically and spiritually. Supporting its national identity, in one form or another, consciously or unconsciously, from the time of its inception onward. It is clearly evident at the time of American independence when Benjamin Franklin proposed that the new nation's Great Seal should feature the image of Moses parting the Red Sea, while Thomas Jefferson proposed that of the Israelites journeying through the wilderness. The connection is unique, deep, and intrinsic. The pattern of ancient Israel is embedded in the DNA of American civilization. Even the name, JerUSAlem, has America engraved in it. Those who laid America’s foundations saw it as a new Israel, an Israel of the New World. Based on Isaiah 9:10, “The bricks have fallen, but we will build with hewn stones: the sycamores are cut down, but we will plant cedars in their place,” the northern 10 Tribes of Israel refused to repent after they were struck by the Assyrians - which was a warning from the Lord. Instead of listening to the alarm, of turning back, and humbling themselves in repentance, they boasted of their resolve, that they would rebuild stronger and better than before. They ignored the warning and rejected the call to return. They defied it. Sadly, their defiance led to the nation’s total destruction years later. The ancient prophecy forms the key to the nine harbingers of judgment, which are given to a nation in danger of judgment – each of which have reappeared on American soil – marking America as the nation in danger of judgment. Before God judges a nation, He sends warning. He sent warning to ancient Israel. This is where we can clearly see the unbelievable link between these two countries, with the attacks of 9/11! The attack were a warning, and like ancient Israel, if the nation ignores God’s warning there will be dire consequences. There were nine harbingers (warning signs) that happened after the first attack when ancient Israel, refused to return to God. These same nine harbingers have been taking place with America since the first warning attack - 9/11! It is clear that these signs are warnings for America in the end times! First Harbinger: The Breach. In 732 B.C., the hedge of protection was removed and Israel’s enemies invade the land and wreak havoc. The calamity traumatizes the nation but it takes place on a limited scale, as with 9/11. The warning is the removal of the hedge. On September 11, 2001, America’s hedge of protection was removed – the breach of America’s security, and was a sign that God has lifted His protective hand. Second Harbinger: The Terrorist. It was the dark shadow of Assyrian terror that loomed over the kingdom of Israel. The danger against which the prophets had warned. And when, years later, Israel’s final judgment came, the Assyrians would again be the means through which it would happen. So, too, the attack on America is carried out by terrorists. The Assyrians were a Semitic people, children of the Middle East. So too were the terrorists of 9/11. Third Harbinger: The Fallen Bricks. The most visible signs of the attack on ancient Israel were that of the fallen buildings and the ruin heaps of fallen bricks. The third harbinger is the sign of the fallen bricks of the fallen buildings. On Sept 11, 2001, Americans were confronted with the same sign, fallen bricks of the fallen buildings of the wreckage of Ground Zero. America was not turning back to God. It was a short-lived spiritual revival that never came. Fourth Harbinger: The Tower. Israel defiantly began rebuilding on the devastated ground, vowing to rebuild higher and stronger. So, too, in the wake of 9/11, American leaders vowed to rebuild at Ground Zero higher and stronger – the Tower begins to rise at Ground Zero. Those involved act unwittingly. Fifth Harbinger: The Gazit Stone. We will rebuild with hewn stone - The Israelites carve out quarried stone from mountain rock and bring it back to the ground of destruction where clay bricks once stood. 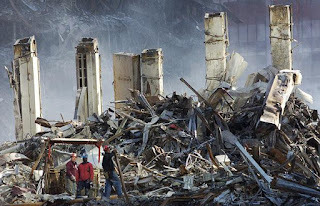 There have been many plans made to rebuild the twin towers bigger and better and a large “hewn stone” was actually quarried out of the Adirondack Mountains in New York and brought to Ground Zero as a cornerstone. 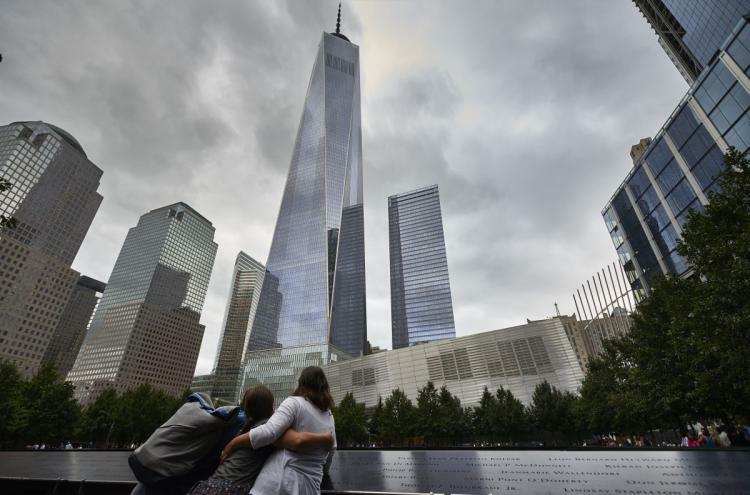 Three years after 9/11, the stone is quarried out of the mountain rock of New York. This massive stone was brought back to Ground Zero. In ancient Israel this stone became a misplaced embodiment of the nation’s confidence in its own power. So too the massive stone at Ground Zero became the symbolic cornerstone of the rebuilding. Public ceremonies accompanied the stone placement. Plans to rebuild Ground Zero would be frustrated for years. Eventually they would remove the stone from GZ altogether. Sixth Harbinger: The Sycamore. The Sycamores have been cut down - The attack on ancient Israel resulted in the striking down of the sycamore tree, a biblical sign of national judgment. The fallen sycamore is a sign of uprooting, a warning and, in ignoring the warning, it becomes a prophecy of judgment. 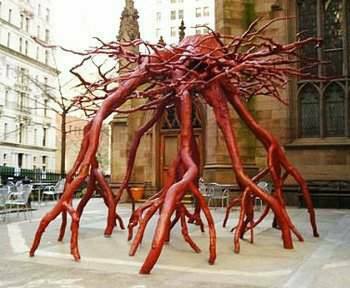 On 9/11, as the North Tower fell it sent debris and wreckage which struck and uprooted an object – a 100 year old sycamore tree growing at Ground Zero. The tree was made into a symbol and named The Sycamore of Ground Zero. When it fell in ancient Israel it prophesied the nation’s downfall and the end of its kingdom. What happens to America depends on if the warning is heeded. Seventh Harbinger: The Erez Tree. But we will plant cedars in their place - In their defiance of God, the Israelites replace the fallen sycamore with a Cedar tree. The cedar, being stronger than the sycamore becomes a symbol of the nation’s arrogant hope that it will emerge from the crisis stronger than before. The English name for this tree is “Cedar,” but the Hebrew word is “Erez.” Erez stands not only for cedar but for a conifer tree of the panacea family. 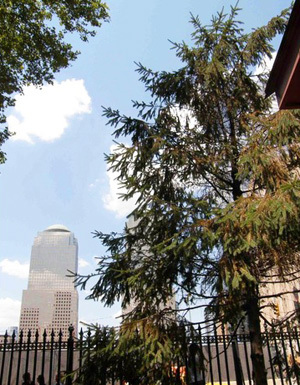 In November of 2003, a tree was lowered at the corner of Ground Zero into the soil where the fallen sycamore once stood. The tree was a conifer, a panacea tree, the biblical Erez! A ceremony was held around the tree and it, too, became a symbol – entitled The Tree of Hope. There is always hope. A nation’s true hope is found only in returning to God. Eighth Harbinger: The Utterance. The Eighth Harbinger was the public speaking of the ancient vow of defiance. For this harbinger to manifest, the vow would have to be spoken in the nation’s capital by a national leader, as it had been in ancient Israel. 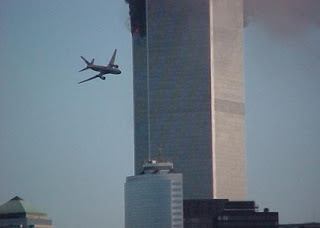 On Sept 11, 2004, every object mentioned in the prophecy of Isa 9:10 had manifested. 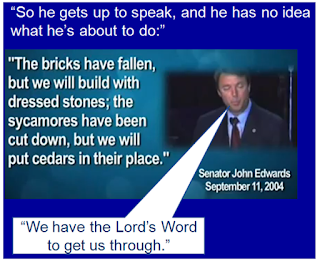 The public utterance of the prophecy had to take place publicly, which happened on Sept 11, 2004 when VP candidate John Edwards, giving a speech in the capital city, quoted this exact scripture word for word in Wash., DC. Without realizing it, he was joining the two nations together and, without realizing it, pronouncing judgment on America. The ancient and the modern were bound together. Ninth Harbinger: The Prophecy. The Ninth Harbinger is the proclaiming of the ancient vow as prophecy, as a matter of public record, and spoken before the words come true. On Sept 12, 2001, the day after 9/11, America issues its official response to the attack. The one in charge of issuing the response was Tom Daschle, Senate Majority Leader. As he closes his speech he makes a declaration – he proclaims the ancient vow of defiance, word for word, to the world. By doing so he prophesies the nation’s future course, all of which comes to pass. Daschle said: “America will emerge from this tragedy as we have emerged from all adversity – united and strong. Nothing … nothing can replace the losses of those who have suffered. I know there is only the smallest measure of inspiration that can be taken from this devastation. But there is a passage in the Bible from Isaiah that speaks to all of us at times like this.” He then went on to read Isaiah 9:10. The prophecy, in its context, concerned ancient Israel. But as a template of judgment, as a sign, it now concerns America. It was given to ancient Israel as warning of judgement, and it's about ancient Israel, but now it's reappearing as a sign of warning to America! And as we saw above, the fact that America bears such a deep connection to ancient Israel makes it all the more striking and fitting for the same signs used to warn Israel of judgement. What's even more remarkable is that the editors of “The One-Year Bible,” which has 365 days of Scripture readings, had decided to include that verse in the Sept. 11 reading. Isaiah 9:10 was included that day in every version for the 16 years prior to 9/11. Since 1985, millions of Americans had been reading this verse on Sept. 11 for 16 years before 2001! The link between America, and the harbingers for ancient Israel, was only discovered in 2005 by Jonathan Cahn! Amazingly, by 2004, these events had all happened with an unseen hand, and people acted unwittingly in the unfolding of this prophecy. Unbelievable proof of God! The warnings, the signs, the harbingers, and manifestations of national judgement are sent - another one of which is the sign of the Shemitah. The sign of the Shemitah was another warning of judgement that was used to warn ancient Israel, amazingly, this same warning of the Shemitah has manifested in America as well! You can read the other warning of judgement, the sign of the Shemitah, here! 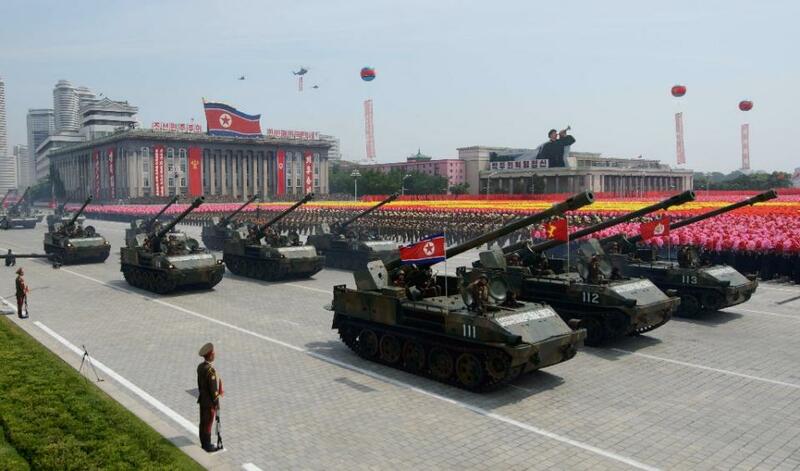 The US and North Korea are absent from the Book of Revelation implying the two nations will be decimated before the apocalypse strikes. I believe these warning signs for America, are a warning of the coming judgement for America, and in relation to why America is not mentioned in the end times. What the surprising coincidental facts! May more and more people to take lessons from them!